Brews - Bent Run Brewing Co.
Our signature beer. Named after the spring where we first started getting our brew water from as home brewers. A clean finishing, light bodied IPA that is very aromatic with a citrus punch due to double dry-hop additions. A game changer of an ‘IPA’. A very tropical, hazy or ‘juicy’, India Pale Ale. Made with Pearl malt and 5 other grains, we add hops 6 times during the boil, and twice in fermentation. We call this IPA ‘the converter’ because many who consider themselves to not like IPA’s, often think differently after trying this one. A high test version of the Sandstone Spring IPA. With the increased ABV comes an increased intensity of spice notes, sweetness, and maltiness for a bolder finish. Be careful though as this one can sneak up on you. This easy drinking pilsner is hand crafted for the everyday beer drinker in mind. We use generous amounts of flaked corn to give this Czech style pilsner a non-so-common taste. Although not considered a light beer by any means, you may be happy to know that a lower ABV and only 140 calories (12oz.) will let you enjoy this refreshing craft lager all day. A full-flavored brown ale with strong nutty and caramel flavors without being overpowering. Because it is light bodied, this very refreshing, slightly sweet ale, is very easy drinking. This beer is named after an equally complex and thrilling local mountain bike trail at Jakes Rocks. A portion of the proceeds from every Deerfoot sold will be donated to help maintain, build, and grow our area mountain bike trails. A rich, dark, creamy oatmeal stout with strong coffee notes and hints of chocolate. A surprisingly light bodied drink that you may want to substitute for your morning java. 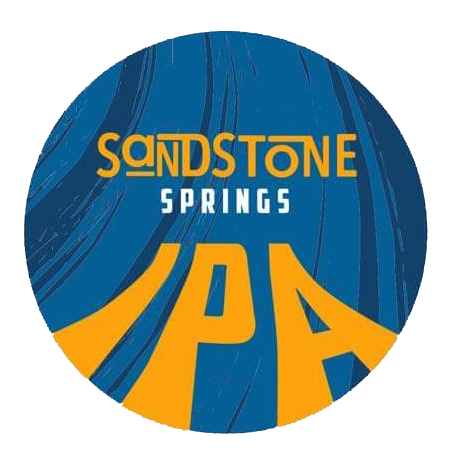 This is the Clark Kent of our Sandstone Springs IPA. A mild-mannered pale ale for those who like a little malt and hop flavor as well as a little alcohol presence without all the bitterness of a big IPA. A stepping stone out of the world of the everyday pilsners and light lagers and into the world of real craft beers. Afull-flavored, spiced ale brewed with real pumpkin, all-natural spices, whole vanilla beans, and local maple syrup from the Lindell farm. All this to remind you of grandma’s pumpkin pie. A seasonal treat brewed only once a year. Get it while it lasts. Make it even more special with a dollop of whip topping. Black Jack – A very unique flavor concoction made of ½ Black IPA and ½ Pumpkin Ale. A brew made with orange zest and coriander. This traditionally hazy wheat style beer has been aged to smooth out the character and give a finish super clean. A very light, crisp, refreshing beer. An ale to warm your sole. A milder bitterness balanced by a malty richness not commonly found in your everyday ale. This one is easy drinking and pairs with just about any food. Perfect for sitting around the fireplace on those cold winter nights. With a little higher ABV to warm you inside. This hopped-up pale ale was created to celebrate the years hard work and the seasonal end-of-summer harvest time. Brewed with hole hops donated by friends and hops grown right here at the brewery. Enjoy this beer and this time of the year with us. This unique brew is crafted for the bold who like to show their wild side after dark ! This dark, rich, malty IPA will surprise you with the first sip. Although dark in color, this medium-bodied ale will not weigh you down. The hop punch balances the richness for a clean finish that invites you for another sip. Like a planetary eclipse, this one doesn’t come around very often either. Our modern-day spin on the traditional festbier – the most popular beer served during Oktoberfest in Munich, Germany. Oktoberfest is the worlds largest beer festival and runs from late September to the first weekend in October. In this 16-18 day period more then 7 million liters of Oktober festbier is served. Thus, this beer is designed to be drank in quantity without being too filling, too sweet, or too high of alcohol. A traditional Belgian Wheat beer known as a WIT. Our WIT is brewed with fresh ground coriander and orange peel that’s hand zested moments before going into the boil kettle. A light and refreshing drink perfect for summertime. Our only beer with rules. After you have one and you start feeling it’s affects you will understand why. Taking 2 months to brew has made this high octane sipper very smooth. Lots of Huell Melon hops in ferment add notes of citrus and sweet melon. Will be sold in limited quantity at the brewing only. Sorry, no crowler or growler fills. $3 sampler. $7.00 per 12oz. pour. Limit 2 per visit. A very low bitter IPA, so don’t let ‘IPA’ in the name scare you aware. The hops in this brew add complex notes of tropical citrus, pear, and stone fruit. Milk sugar adds unfermentable sugars to give a sweetness and smooth creaminess. Just picture yourself sitting on a beach while drinking a vanilla milkshake from a coconut. X-Files – Experimental IPA 2.0 – An IPA dry-hopped with the Huell Melon hop. We are always experimenting with new concoctions and variations of malts, hops, and yeast. This is your chance to try a one-off brew that isn’t available anywhere else and to also give us some feedback on whether this experiment is something that we should turn into a regular offering. We are always experimenting with new concoctions and variations of malts, hops, and yeast. This one used the ‘Sabro’ hop exclusively in the boil, whirlpool, and dry hop. This is your chance to try a one-off brew that isn’t available anywhere else and to also give us some feedback on whether this experiment is something that we should turn into a regular offering. We took the Angry Snowman stripped his bean and nuts and added some fruitiness. You can name them. Both are delicious. This strong porter is named after the locally infamous mud’n hole ‘Mud Run’. Just around the corner from the brewery, this dark mysterious place has broken many a 4×4. But making it through is something to be proud of. Be careful though- if you have too many of these and get in too deep, you may need towed home. ABV= Alcohol By Volume. – How fast you get bent. SRM= Standard Rating Method. – How dark the beer is. 0 being water and 40 being Black. IBU= International Bitterness Units. – An idea of the bitterness and the amount of Hops used.